Sterling Silver Dragonfly Pendant, Two Sizes - Made in South Carolina 4th generation silversmiths, our solid Sterling Silver Dragonfly Pendants are considered wearable art. The larger dual purpose dragonfly can be worn as a pin or a pendant, the pin and pendant bail are creatively hidden beneath the dragonfly so that it appears to float when worn. Chain not included with either size pendant. 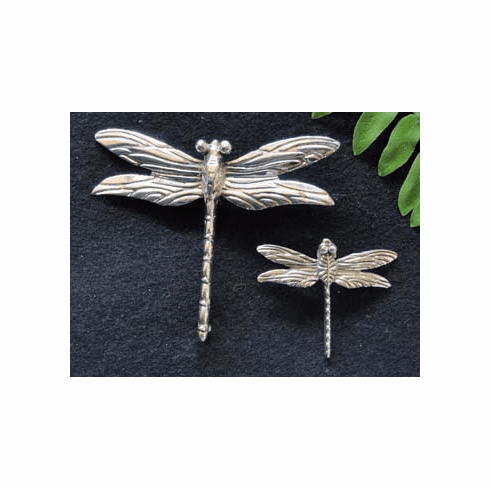 The large Dragonfly Pendant/Pin measures 2" long with a 2-3/4" wingspan and the small Pendant measures 1-3/8" long with a 1-5/8" wingspan. Gift Boxed.